I live in an area that is visited by many a variety of birds (and squirrels). 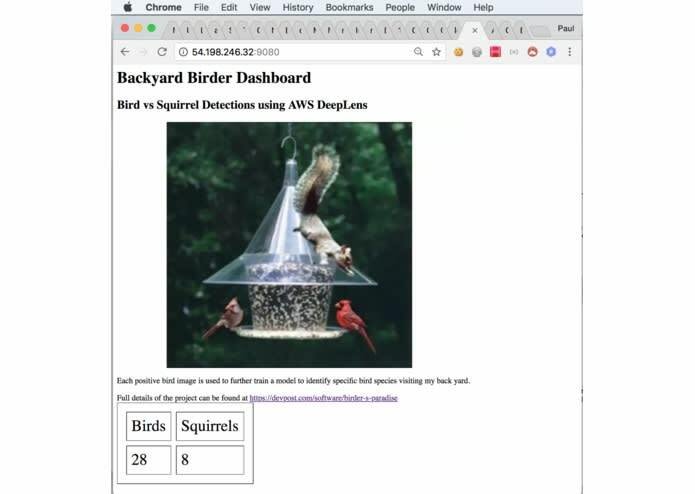 I thought it wold be interesting to explore the abilities of Amazon's DeepLens to be able to identify bird species by both visual and song characteristics as well as keep track of how many squirrels disrupt the feeders each day. I had a difficult time finding good seed image libraries for bird species and wanted to get my hands dirty with this new hardware. I thought I could leverage the ease of getting a sample project running on DeepLens to do a course collection of bird images that I could further develop into my species identification model. 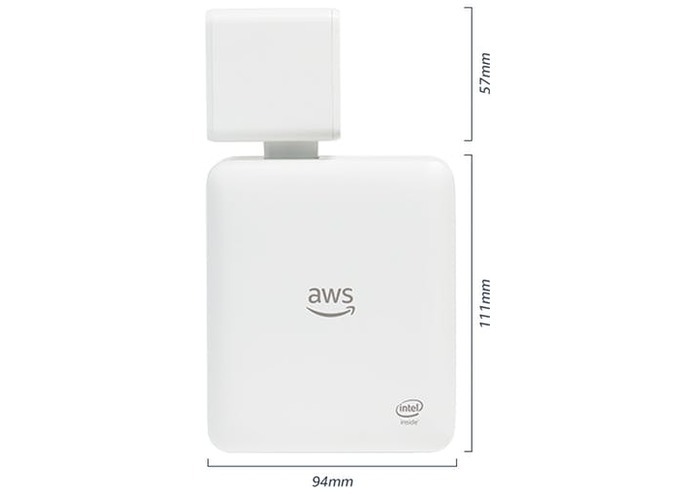 The AWS DeepLens hardware allows locally running image processing to occur using models trained using a variety of machine learning methodologies. The graphics processing hardware allows for low latency video stream processing at the edge (i.e. disconnected from the cloud). 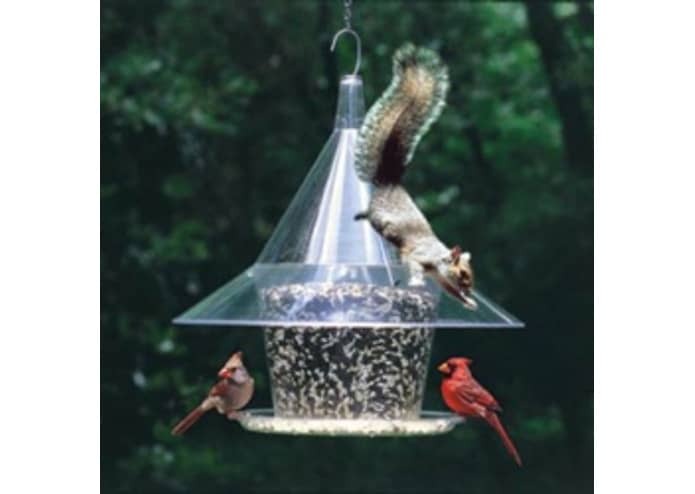 My application, using an included sample MXNet trained model (deeplens-object-detection), identifies the visitors to my bird feeders in my yard. The sample model is able to identify birds with reasonable accuracy. There is no classification for squirrels in this model but they score relatively likely against the "cat" and "dog" classifier (this is a hackathon, isn't it?). Upon a high identification probability score of recognizing a bird or a squirrel, a message is published to a message topic (MQTT) where a lister process will tally the counts and store them to a database where a daily squirrel vs. bird scorecard can be accessed via the web. The output isn't pretty but it shows your running identification counts. 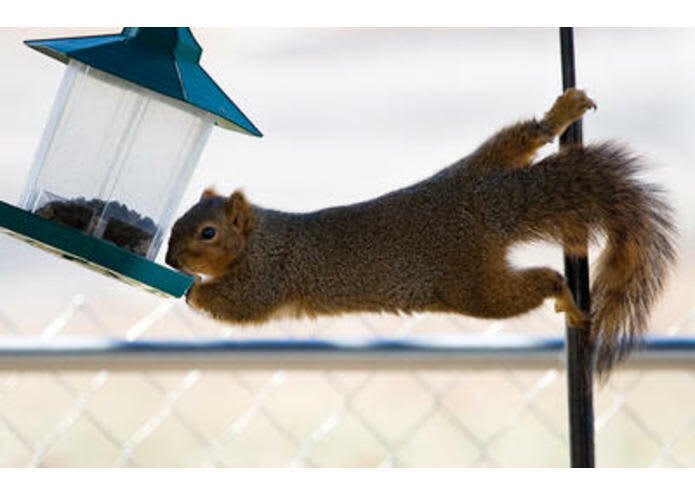 This trigger could be extended to take some physical action to deter the squirrel from the feeder, however I am less concerned with that and more interested in collecting positive bird species samples for a more specific bird model. Initially I utilizes a pre-trained model, but this is the first step in a broader project that is a "train the trainer" application. Using existing coarse models as the source for generating new seed images to train a new model using AWS SageMaker, in this case, to specifically identify bird species. This project will give you some information about the DeepLens framework, hardware and a references to a guide for setting up your own device and customizing a model to do your own detection. I encourage you to use it as a starting point to exploring this platform. The code to this project can be found on github at https://github.com/plangdon/deeplens_birds. The architecture of this solution can be adapted to support your trained model and notification/action pipeline. 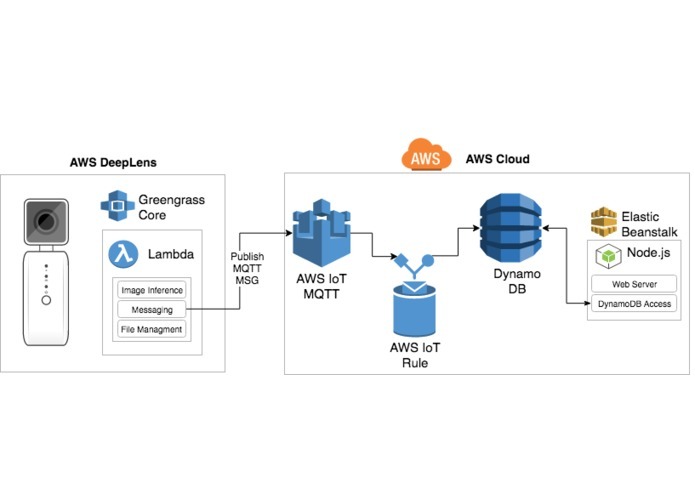 Push as much processing and resource utilization to "the edge"
Running on the AWS DeepLens is Greengrass Core allowing Lambda code to run on DeepLens hardware. Lambda code deployed to DeepLens processes the image recognition/inference from the loaded model, handles the secure messaging to AWS IoT and saves local files when identification criteria is met. 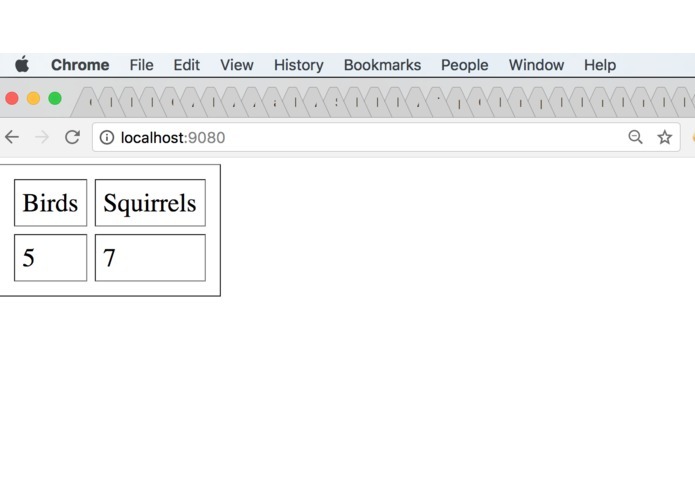 Inside of Elastic Beanstalk, a Node.js web server hosts a page with the day's tally of bird and squirrel sightings stored on DynamoDB. Chances are this is your first look at AWS DeepLens so I wanted to cover a quick intro to the hardware and the AWS components used in this project. Amazon DeepLens - What Is It? 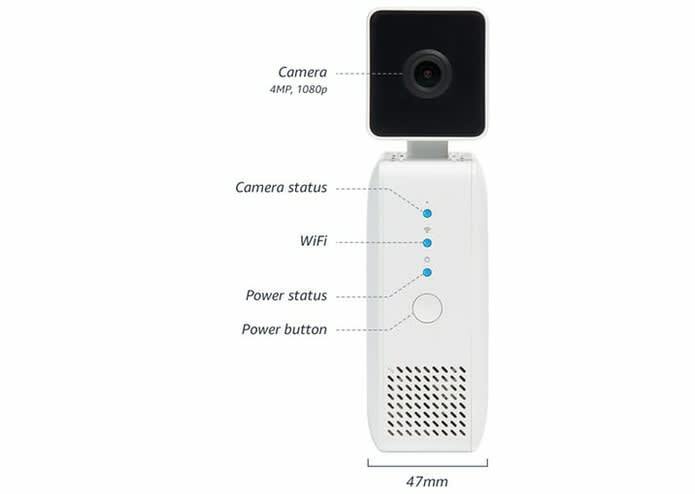 AWS DeepLens is a wireless video camera and API that you can use to learn how to use the latest Artificial Intelligence (AI) tools and technology and develop your own computer vision applications. Use AWS DeepLens to get hands-on experience using a physical camera that runs real-time computer vision models, examples, and tutorials. Get started with AWS DeepLens by using any of the pretrained models that come with your device. As you become proficienct, you can develop, train, and deploy your own models. AWS DeepLens is powered by an Intel® Atom processor, which is capable of processing 100 billion floating point operations per second (GFLOPS). This gives you all of the compute power that you need to perform inference on your device. 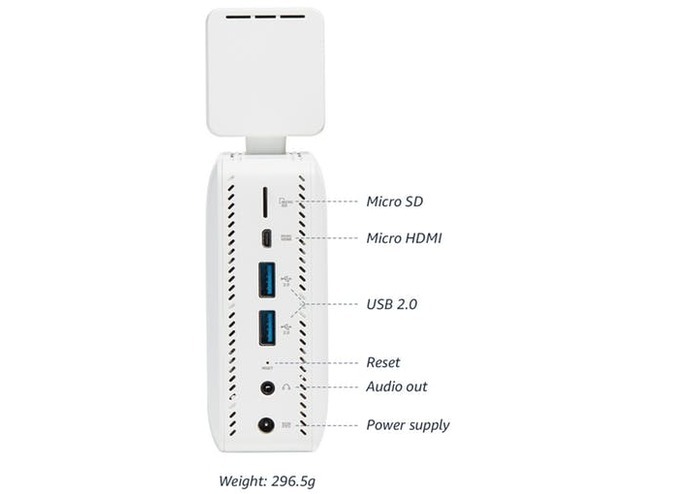 The micro HDMI display port, audio out, and USB ports allow you to attach peripherals so you can get creative with your computer vision applications. 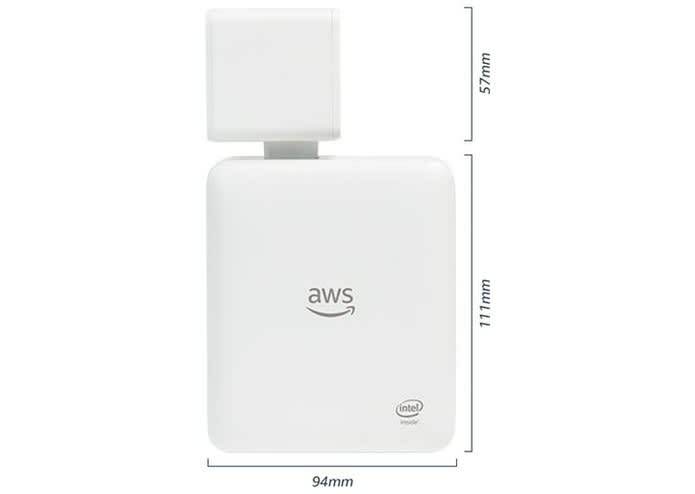 The AWS DeepLens device uses deep convolutional neural networks (CNNs) to analyze visual imagery. You use the device as a development environment to build computer vision applications. AWS DeepLens is ready to use right out of the box. 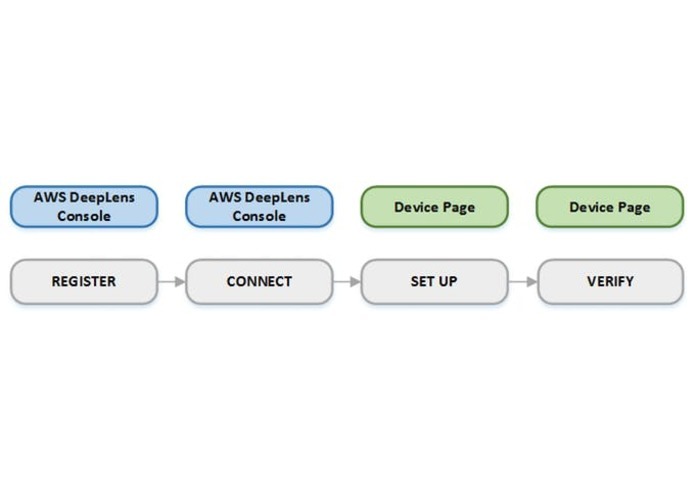 After you register AWS DeepLens, deploy a sample project, and begin using it to develop your own applications computer vision applications. The following diagram illustrates how AWS DeepLens works. Device stream – the video stream is passed through with no processing. Project stream – the results of the model's processing video frames. 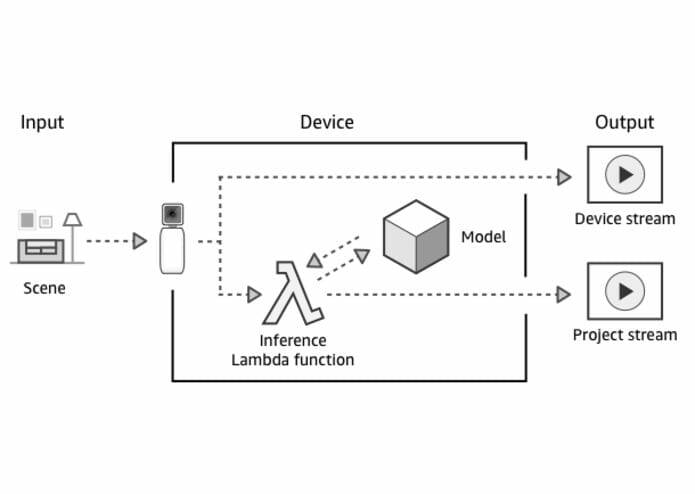 The Inference Lambda function passes the unprocessed frames to the project's deep learning model where they are processed. 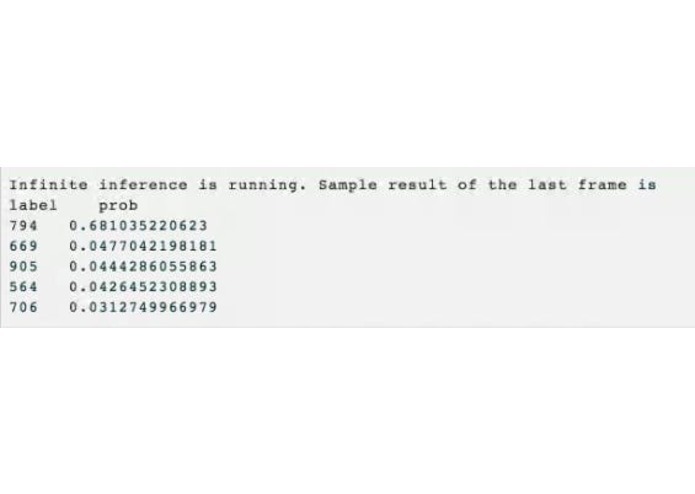 The Inference Lambda function receives the processed frames back from the model and then passes the processed frames on in the project stream. You will need the DeepLens hardware to build this project. Amazon has a really good portal for the initial setup required to prepare your DeepLens and connect it to your network. In this project I used a combination of sample models and trained my own model to further help in identification. The following steps show how you can train your own model. I am assuming you have some experience of working with AWS, I am including links to help articles to each of the tasks. All services should be configured in the same VPC for security and roles management simplification. 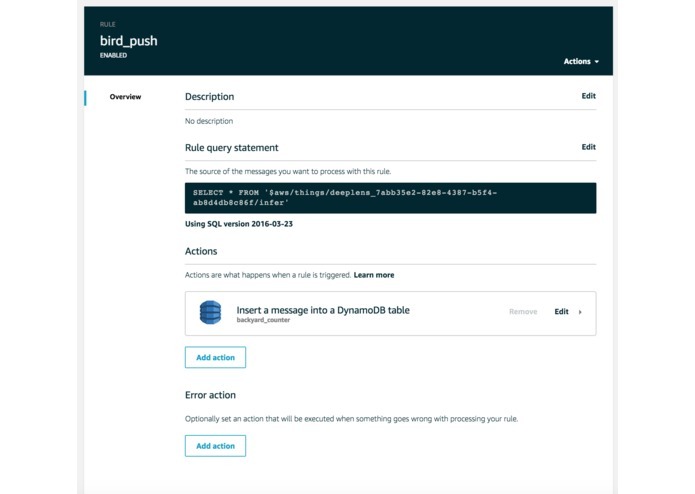 Create a new table in DynamoDB named: "backyard_counter"
Add a new rule to AWS - click "Act"
the topic name "deeplens_xxxxxxxxxxxxxxx" will be obtained from your deployed project, it is the bottom of the deployed project page - so this is a little "chicken/egg" scenario: you setup the rule first and just put in dummy field, then come back and update the rule after the project is deployed. Create an application and call it "birdreport"
Upload the zip file from my git project "deeplens-bird-detection.zip"
In left navigation under "Resources" - select "Projects"
For my project I am "Creating a new blank project" - click "Next"
pick the custom Lambda we created in the section above; "deeplens-bird-detection"
Select your device radio button on the next page, and click "Review"
Confirm the data and click "Deploy"
Currently the SageMaker only supports training new models with Apache MXNext, I have had a little experience training model using Tensor Flow and was hoping to import my existing models. It was a good exercise for me looking at how MXNet works and expand my scope of ML frameworks. I look forward to the addition of future ML Frameworks to the DeepLens platform so I can continue trying them out to find the best options for the job. Even though I was able to quickly get up and running using the sample models, I was happy I took the extra time building out my own model using SageMaker and Jupyter notebooks. Python is not my strongest language and working with jupyter notebooks made it a little easier to work through the process. I recommend after you get a couple of the sample models up and running you take the time to train your own model as that really extends the value of this platform. It was interesting to explore the Apache MXNet framework, I had previously used Tensor Flow and I like to make sure I am keeping on top of multiple options when considering technologies. Apache MXNet is a very mature project and active user community. I learned how this customized hardware and software integration allows for very fast deployment of deep learning methodologies and a quick learning tool for developers to begin exploring the technical area. I was also very happy to find the extensive documentation that was put together by the AWS DeepLens team. It was a very well documented step by step that was helpful when digging into a totally new platform. This first pass of my project is great for weeding out the birds from the squirrels, but I am interested in extending the model to do more detailed identifications. The images captured during the first phase of the project will be a good resource as I extend the training to more specifically identify bird species. As I mentioned above, currently the SageMaker platform only supports MXNet models, I am interested in porting over my Tensor Flow trained models. Here is a link to my git project with my training information for bird species identification using Tensor Flow. I am also very interested in seeing if I can adapt the hardware to include bird songs as part of the identification criteria. Updated git for the web page that shows counters.